Back to work, back to school! As summer now drifts into autumn the days grow shorter and the weather turns cooler but this is a most rewarding time of year to be out and about. 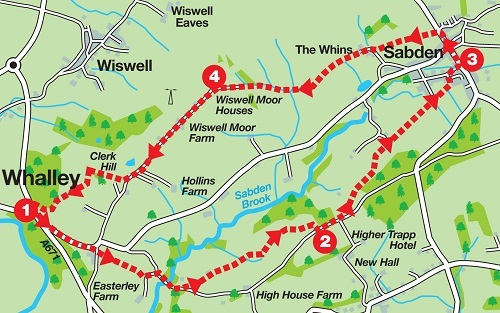 This week’s walk explores “the Hidden Valley” of Sabden Brook between Spring Wood picnic site and the village of Sabden. At any time of year this is a delightful place made all the more pleasurable by the fact that it is so infrequently visited. In autumn its beauty is enhanced by the changing colour of its many trees. 1. From the car park turn left onto Accrington Road. Walk alongside the golf course to Portfield Road. Turn left. Walk uphill to the junction with Portfield Lane. Cross to a footpath. From the stile bear right to descend gently to another stile. From this cross two fields to reach the drive of Easterley Farm. and then bear left to a metal gate. Through this turn right onto a track to walk up to a riding centre. As the track reaches buildings follow it right and then turn left at the end of tall conifers. and after crossing this follow a fence aiming towards a stile. taking you past a wind turbine and then close to a wall on your right. Follow the wall to its far corner and turn right, cross the wall and keep ahead to reach Back Lane. 2. After 250yds turn left onto the farm drive of Whittaker's Farm. Follow the drive as it swings to the right and then as the drive hairpins left down to the property continue along a grassy track to cross a stile. This footpath takes you down to Sabden. As it nears the village it joins a bridleway. leading Padiham Road. Turn left. 3. Walk along the road heading uphill crossing Sabden Brook and passing the White Hart on the right. After passing Crowtrees Road on the right take a footpath on the left. Following hedgerow on the left keep ahead over two fields to reach a stone stile. and continue the ascent to another stile. Cross the next pasture to its far left corner using a telephone pole as a marker. When you reach the track turn left. on a track to Clerk Hill. As you reach the property turn right by a gate post. Follow the path as it edges around the house. and head downhill with a fence on your left. After 250yds cross a stile and then a footbridge to reach the golf course. Keep ahead with Spring Wood on your right. A stile in the corner will put you on the car park. POI What is immediately striking about Sabden is that has an industrial heritage in a charming rural setting. An old mill chimney survives in a street of terraced housing. In the 19th century the high quality of the water was ideal for calico printing. At its height there were seven mills in Sabden employing other 2,000 people. More recently Sabden has claims to be one of the world's great centres of treacle mining - but that is most definitely another story.